As winter 2018 draws to a close, La Sirène has added another beer to its core lineup. It's one with a suitably wintry hue that's the closest the brewery has come to its much-loved Praline in terms of colour. 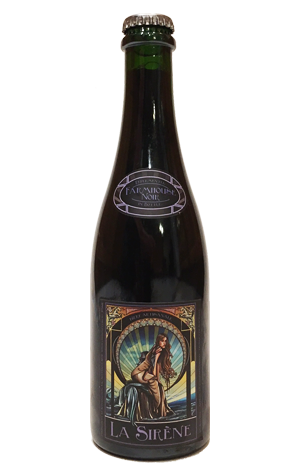 Any similarities with that decadent stout pretty much end there, however, as this sits within their farmhouse lineage as the next step along from their delightful, vinous Farmhouse Red. The label suggests serving at 7C but it seems to benefit from being allowed to get warmer still; it maybe vastly different in character to the porters and stouts with which it shares some visual cues but, like those more traditional winter beers, it too opens up as the mercury rises. Certainly, the soft espresso and dark caramel malt characters appreciate being freed from the fridge, smothering the beer's relatively intense acidity and joining the citrus and dark berries to create a tangy, almost dessert like treat that lingers long on the palate.